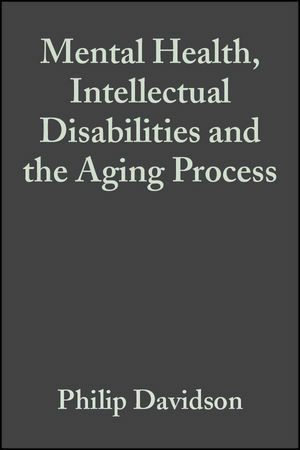 This book is the third in a series with the International Association for the Scientific Study of Intellectual Disabilities (Series Editor: Matthew P. Janicki). These publications are designed to address the issues of health, adult development and aging among persons with intellectual disabilities. For many years it has been recognized that some adults with intellectual disabilities are at elevated risk for mental and behavioral health problems. Often the aging process can complicate the identification, diagnosis, treatment and prevention of this type of dual diagnosis and present complex challenges to clinicians and carers. This book is designed as a practical resource for those involved with the support, care and treatment of persons with intellectual disabilities, and should prove particularly useful as this community achieves increased longevity. The book is divided into three parts: Prevalence and Characteristics; Diagnosis and Treatment; and Service System Issues. Overview of Aging, Emotional Health and Behaviour. Section I: Prevalence and Diagnosis. Prevalence of Mental, Behavioural and Neurobehavioral Disorders among Older People with Intellectual Disabilities. Assessment of Behavioural and Psychiatric Disorders. Depression in Adults and Aging Individuals with Intellectual Disabilities. Behavioural and Psychiatric Overlays from Physical and Medical Conditions. Emotional Health and Aging in Adults with Down Syndrome. Section II Treatments and Interventions. Psychotherapy and Other Psychological Interventions. Dynamics of Bereavement and Grief Reactions. Section III Service System Issues. Community Mental Health and Support Services: Planning Principles and Models. Prevention Strategies and Community Education.